Professor PJ Ouseph, a longtime colleague in the UofL Department of Physics and Astronomy, passed away on August 27, 2018. He was a faculty member from 1961 to 2004 and Professor Emeritus since 2004. He was the Chair of the Department from 1978-1984. Even after his retirement, he remained research-active for several additional years. He served the university with distinction as a scholar, physics educator, and administrator. 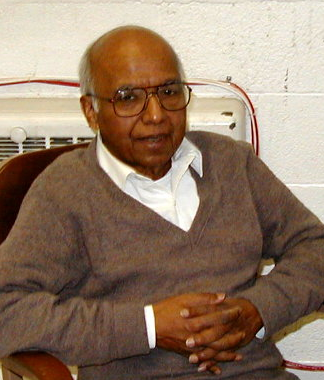 Dr. Ouseph was an Experimental Condensed Matter Physicist with wide-ranging research interests. In his research career, he used a variety of experimental techniques ranging from Mossbauer spectroscopy, positron annihilation, and scanning tunneling microscopy for probing properties of different types of materials that included rare earth solids, superconducting materials, thermoelectrics, graphitic materials etc. Circa 1990, he established a Scanning Tunneling Microscopy (STM) facility and was very proud of this set up. The STM images of mercury droplets on graphite as observed in his laboratory were used on the cover page of the journal Langmuir. He published more than 65 peer reviewed scientific articles and two monographs: “Introduction to Nuclear Radiation Detectors,” published by the Plenum Press (1975) and “Technical Physics,” published by van Nostrand Co. (1980). PJ taught, mentored, and nurtured several generations of students. He had a good instinct for designing elegant physics demonstration experiments and students thoroughly enjoyed taking his introductory physics courses. The proudest moment of PJ’s teaching career was when he received the prestigious Oppenheimer Award from the American Association of Physics Teachers (AAPT) in 1986. Subsequently, he also won an equipment competition of the AAPT in 1990. In 2011, the department celebrated his professional career spanning 50+ years and established the PJ Ouseph Scholarship Fund for Freshmen Physics Students. Anyone wishing to make contributions to this scholarship fund in remembrance of Professor PJ Ouseph, please make your check payable to University of Louisville Foundation and mail it to Director of Development, College of Arts & Sciences, 2323 South Brook Street, Louisville, KY 40292. Please write “PJ Ouseph Scholarship (E1954)” on the face of the check. Alternatively, donations may be made by clicking at the following link: http://fundforuofl.org/pj-ouseph. Professor Ouseph will have a special place in the hearts and minds of students, staff, and faculty of our department as well as the wider Indian community in Louisville. He will be sorely missed.